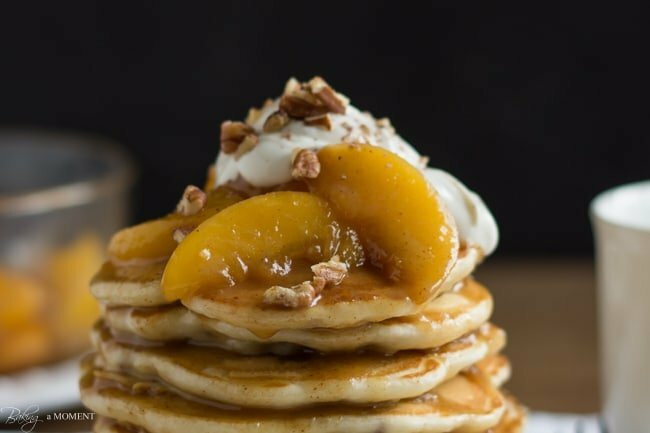 Fluffy Buttermilk Pancakes are studded with Crunchy Toasted Pecans, drizzled with a sweet Brown Butter Bourbon Peach Syrup, and topped with creamy Honey Vanilla Greek Yogurt. Can you believe I’ve never posted pancakes on the blog before??? That is just wrong. Especially considering they get made on a pretty regular basis around here. It took Mystery Dish to finally make an official pancake post a reality. You know what I love about this dish? It’s peaches, which are summery, but the brown butter, toasted pecans, and bourbon are so cozy and warming they put me in mind of fall and winter. And since our summer produce doesn’t come in until a little later in the season here in the Northeast, I chose to go with frozen peaches. Which makes life so simple since they’re already peeled, de-pitted, and sliced. And it also means that you can enjoy this dish all year ’round. Maple syrup, it’s over. No offense. It’s not you, it’s me. Actually, it’s not me either. It’s Brown Butter Bourbon Peach Syrup. When I started out I thought it was just going to be a one-time thing, but who am I kidding? There’s no going back now. Oh my dear sweet Lord. It is heavenly! So buttery. The peaches give off a some of their sweet nectar plus there’s a little bit of dark brown sugar to bring out the caramel-y notes. I added just a hint of cinnamon too, and the bourbon just takes it to a whole different level. The pancake recipe is from Better Homes and Gardens. I, like so many other new brides, received their cookbook as a gift when I got married. Their buttermilk pancake recipe is spot-on and I’ve probably made it hundreds of times. If you don’t keep buttermilk on hand, you can sour regular milk with a teaspoon or so of lemon juice or vinegar, or you can substitute equal parts plain yogurt (Greek or regular) and milk. It works great. Place the Greek yogurt, honey, and vanilla in a small bowl and stir to combine. Set aside. Place the butter in a large skillet over medium heat. Allow it to melt, then foam and crackle, and finally to turn a nutty brown color (watch it carefully after it is no longer foamy- it can burn easily). Add the peach slices, dark brown sugar, bourbon, cinnamon, and salt, and cook, stirring occasionally, until it becomes syrupy and the peaches are tender. Stir in the vanilla and set aside, keeping warm. Place the flour, pecans, sugar, baking powder, baking soda, and salt in a medium mixing bowl and stir to combine. Place the buttermilk, butter or oil, and egg in a large liquid measure, and whisk to combine. Preheat a skillet over medium heat and grease it lightly with butter. Stir the buttermilk mixture into the flour mixture until just barely combined. Batter will be lumpy. Do not overmix or the pancakes could come out tough. Cook the pancakes in the prepared skillet, until golden on both sides. Top with Brown Butter Bourbon Peach Syrup and Honey Vanilla Greek Yogurt. 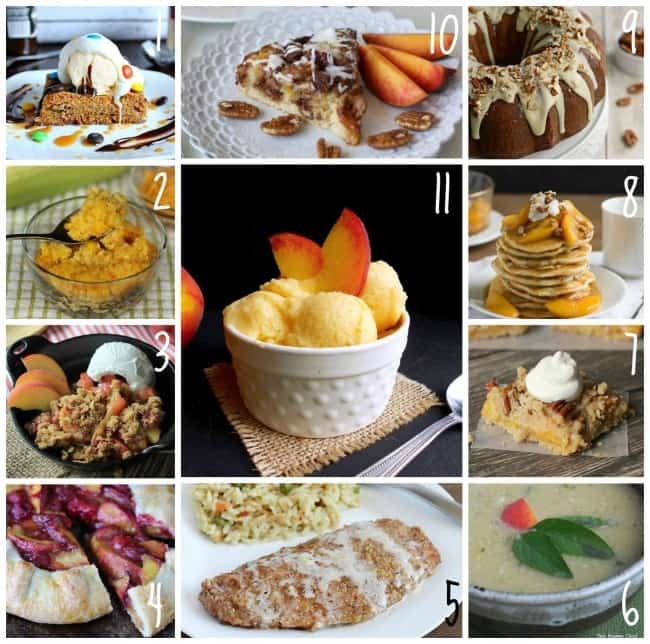 But first- check out what all my Mystery Dish peeps came up with! Pretty awesome right??? Thanks again, Meriem, for making all this deliciousness possible! « Previous PostStrawberry Pretzel Popsicles, and a Giveaway from Chobani! Oh wow, this post couldn’t get any more perfect I tell you! That syrup does sound like the best thing that has ever happened to a stack of pancakes – brown butter + bourbon??? I’m dead. It looks beyond delicious! Also, this stack is gorgeous. I so can tell that this pancake recipe is a keeper! Aaaaaand that gif is great too! I’m drooling! Thank you so much Consuelo- that means a lot coming from you because I know you are the queen of delicious breakfasts 😉 Hope your week is lots of fun too! Oh how fabulous! 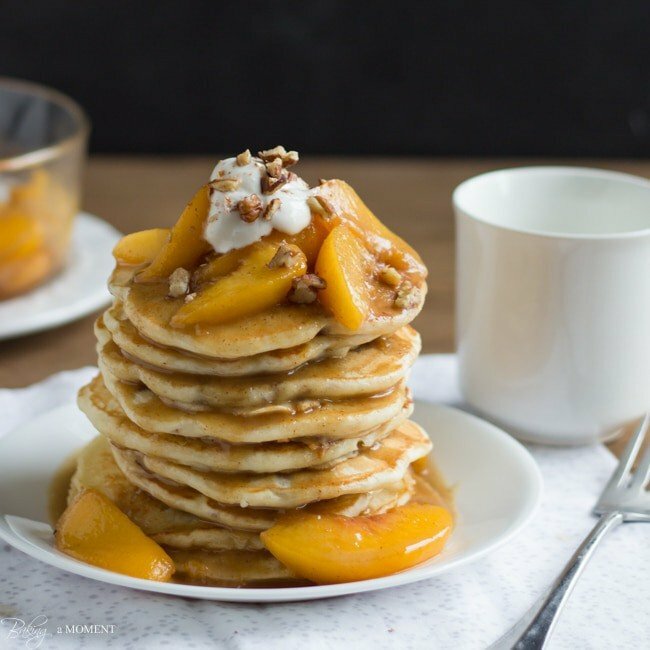 Pancakes and peaches are a perfect summer breakfast. This looks scrumptious, Allie! Mmm…they look like a fabulous breakfast! Nothing like fruit over pancakes and waffles. Have a fabulous week Allie! Oh yes. I couldn’t agree more. Growing up we always went to Uncle Bill’s Pancake House at the Jersey shore and I always ordered pancakes with fruit 😉 Thanks, Melanie! these pancakes look so decadent! yum. Thanks, Sarah! They are a real special treat. Glad you enjoyed; thanks for the sweet comment! I’ve only had peaches over pancakes one time and I was just a little kid. This photo brings back memories of that breakfast. Thanks for sharing they look so yummy! So glad you made these, LOVE that syrup too!! I want to dive in with that fork. That syrup does sound out of this world amazing. What a fabulous stack of pancakes and totally delicious. Of the course its the syrup that puts is over the top!!!! What an incredible stack of pancakes! That is photography genius! Delicious too I bet. Seriously Allie the photography on these pancakes is insanely beautiful. I am so in awe. Pinning! Oh yeah. These look SO GOOD!! We have pancakes all the time around here, too! I love that your 5 year old calls them pan-a-cakes! So cute! These are on my must-try list. Pinned! Thanks so much Jen! Panacakes are definitely a favorite around here, especially on the weekends. Thank you so much for pinning, sweetie! Wow, these pancakes look divine! Love the peach syrup, that sounds amazing! Brown butter bourbon peach syrup??? My goodness I need that in my life! haha I’m more of a waffle girl myself (I hate flipping pancakes!) but I must try these! Lol I *almost* did waffles! But I thought that pancakes would be more photogenic. I’m so superficial!!! I can’t even deal with how amazing this looks and sounds right now. I really should leave catching up on food blogs until AFTER I break my fast! Brown butter and bourbon?! You are a ledgend. Haha I love the gif!! Hope you’re well, it’s been a while!! Yay for breaking your “no-pancake-post” streak, Allie! These photos are incredible. Pancakes are one of the best foods in human existence. I just made buttermilk pancakes yesterday and savoured every bite. The only thing that would’ve made my experience better is if I made your bourbon peach syrup. Girrrrrrl, that needs to happen in my life, stat. This stack looks delicious! Adding to my pins! Are you kidding me with this goodness?? LOVE/YUM. Aaw your little guy is too cute, but this is one beautiful stack of pan-a-cakes! 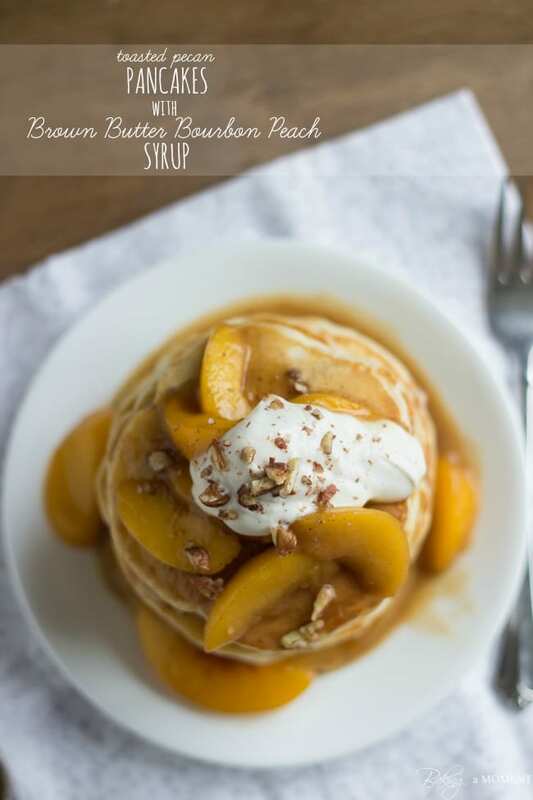 Love the peaches and the brown butter bourbon syrup sounds divine!!! The photos and gif look amazing too – pinning! Thank you so much, Kelly! I’m wishing for a stack of these this morning, lol! These are my kind of pancakes! Thanks for linking up with What’s Cookin’ Wednesday! By the time I put all the components of that amazing breakfast together it would be supper time, next month. Lol! That’s why I’m a big fan of working ahead. The syrup can be made the night before and reheated.